Discarded books can be used to make this attractive lamp for your den, office, or actually any room in need of a new table lamp. This is a guide about library lamp made of books. Need a light? Have a bunch of old books laying around that you're not interested in reading? Make a library lamp! This unusual and functional work of art is sure to get great reviews from friends. With a ruler, mark the center of each of the books. Clamp the books closed, then drill a hole in the center of each book. Assemble the lamp kit (or recycled lamp parts) using the books as the body of the lamp. Insert the pole through the drilled holes and stack the books on the base. If you are creating your own base, paint a piece of wood that measures larger than the bottom book, and drill a center hole in it. For a frosted look, like that of the lamp in the photo, you can lightly spray paint the lamp with a tan or gray paint. For a shiny look, varnish the books. Add your light bulb and lamp shade as the final touches and voila! Another bright idea for Thrifty Fun lovers. Love the lamp! What a neat idea. I love books too (and treasure them), but no one wants Reader's Digests, and those would be perfect for something like this. An idea like this, as with altering unwanted books, keeps those that would otherwise end up in the landfill as something useful and repurposed. 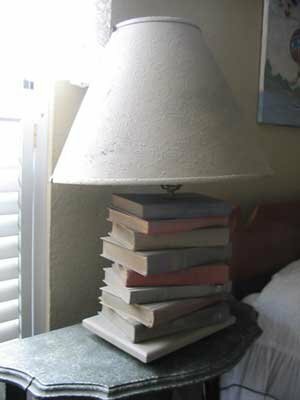 I love the book idea for your lamp.....I have a lot of old books and I think I will do the same thing....Thanks for the tip. WHAT A COOL IDEA--LOVE IT!! You may wish to pay attention to the copyright & publication dates of the books. Personally I like books too much to poke a hole through them *sigh* but a lamp like that may look really good in my den.